The results aren't what you'd expect. Income investors rely on dividend stocks because of the unique combination of current income and long-term growth prospects that dividend payers offer. Vanguard has two primary dividend-focused exchange-traded funds, and they attack the market from different angles. The Vanguard High Dividend Yield ETF (NYSEMKT:VYM) focuses on top-yielding stocks, while the Vanguard Dividend Appreciation ETF (NYSEMKT:VIG) puts greater emphasis on long track records of consistent dividend increases over time. So far in 2017, the market has posted solid positive returns, but only Vanguard Dividend Appreciation has outperformed the broader market. Meanwhile, lagging performance from Vanguard High Dividend Yield suggests at least short-term pressure on high-flying high-yield dividend stocks. As you can see in the chart below, the two Vanguard dividend ETFs bracket the return of the Vanguard Total Stock Market ETF (NYSEMKT:VTI), which is designed to track the entire U.S. stock market. Vanguard High Dividend Yield hasn't been able to keep up with the broader market, lagging during the most recent rally and trailing by 4 percentage points. 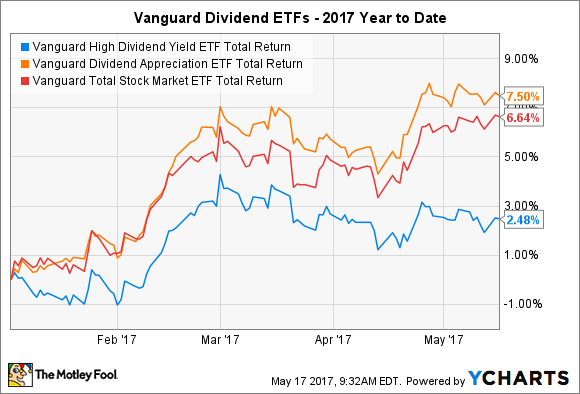 Meanwhile, Vanguard Dividend Appreciation has outperformed, but only by a single percentage point. VYM Total Return Price data by YCharts. It might seem surprising at first glance to see such a substantial disparity in performance. Over the long run, the differences between the two funds have been a lot smaller. Vanguard Dividend Appreciation does have a slight advantage, but average annual returns over the past 10 years of 7.35% on an annualized basis are only marginally better than Vanguard High Dividend Yield's 7.03% average annual returns. What's happening with high dividend yield stocks? When you look more closely at the two funds, you can find at least a couple of reasons for the short-term disparity. First, among some of the big-name stocks in the market, Vanguard Dividend Appreciation has managed to avoid weaker performers that Vanguard High Dividend Yield has owned. For instance, energy giants ExxonMobil and Chevron easily qualifies for inclusion as a high-yield dividend stock, and it's the second-largest position in the Vanguard High Dividend Yield portfolio. Yet the shares, which have fallen 7% to 8% so far this year on weakness in crude oil prices, aren't included among Vanguard Dividend Appreciation's top holdings. Similarly, the telecom market is a big source of high yields, with AT&T and Verizon both among key holdings for Vanguard High Dividend Yield. Those stocks have lost 8% to 13% of their value this year. Vanguard Dividend Appreciation has missed out on those losses, because the stocks don't qualify for the index that the ETF tracks. Finally, some higher-profile top-yielding stocks have had to cut their dividends, punishing funds that bet on their ability to keep paying consistent quarterly distributions. Frontier Communications is a key example, as the company slashed its dividend by more than 60% to conserve cash. Vanguard High Dividend Yield has only a small position in the stock, but again, Vanguard Dividend Appreciation avoided the loss entirely. Is Vanguard Dividend Appreciation simply better than Vanguard High Dividend Yield? It's easy to conclude that the dividend appreciation investing model is a smarter way to play dividend stocks than the high-yield model. Yet that isn't consistently true during short periods of time. From time to time, high-yield stocks outperform their slower, more steadily growing counterparts. Whether you prefer Vanguard High Dividend Yield or Vanguard Dividend Appreciation largely depends on your immediate needs and your long-term goals. Either can make a good addition to an investment portfolio, and even though Vanguard Dividend Appreciation is having the better showing so far in 2017, there's every chance that Vanguard High Dividend Yield will close the gap and keep delivering the solid returns that long-term investors have enjoyed for more than a decade.